Intravenous administration is an effective way to administer minerals, vitamins and antioxidants. Oral vitamin-minerals may not work for certain people due to the limitation of intestinal absorption and cellular transport systems. Through the use of intravenous medicine absorption can be increased dramatically and act as a supportive therapy for increasing energy, sports performance, anti-aging and speeding up recovery from illness. All IV therapies and injections at can be customized for each patient and can be adapted for any concerns or specific disorders that you suffer from. If you don't see what you are looking for we can often customize a formula specific to your concerns after an initial assessment. All IVs except those specified on the IV wellness page must first be assessed during a full naturopathic intake to determine the appropriate IV therapy for your individual case and to ensure safety and efficacy of your treatments. Do you know that you might have a few too many this weekend? 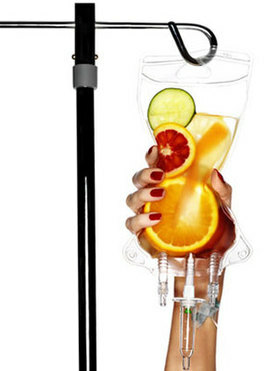 This IV rehydrates you and replenishes B vitamins, magnesium and glutathione to help prevent the effects of hangovers. Get additional nutrients including magnesium and taurine to relax your bronchioles as well as B vitamins for relaxation. Breathe freely with supportive amino acids for the lungs. Are you scheduled for surgery or being treated with injection therapy? This IV contains large amounts of collagen forming amino acids and nutrients specific to healing. This IV is also great for anti-aging treatments as it helps build collagen. Macular degeneration can be debilitating. IV therapy can help to heal the damage done by ARMD. Anti-oxidant nutrients and amino acids specific to the eye can prevent further damage and help to maintain eyesight. A great option for those who are suffering from the symptoms of low mineral status or need replenishment after chelation therapy. This is also a great alternative to taking a daily multivitamin as the absorption from IV therapy is far superior. Is your immune system weak or have you been suffering from a chronic sickness that you can't seem to shake? Boost your immune system and fight infection by using 15 grams of IV vitamin C as well as other nutrients to get back to your life. Reduce physical and mental symptoms of anxiety and panic disorder by increasing your nutrient load. This IV utilizes calming amino acids, magnesium and B vitamins to reduce feelings of anxiety. Often multiple treatments are necessary to have lasting effects. ​Make your diet and exercise the most effective it can be! Get your best fat burning results from increased B vitamins, carnitine and support for your liver in a hydrating IV. Best utilized in conjunction with an appropriate diet and exercise or as part of the HcG Weight Loss plan. ​Speed up the recovery process by having an IV that replenishes lost fluids, electrolytes and nutrients that can speed healing and prevent cramps, nausea and overall fatigue. This IV also contains amino acids important in healing and is followed by a glutathione IV push to reduce oxidation in the body. Great for chronic fatigue, hepatitis, Epstein-Barr virus or other chronic viral infections. Get a handle on your health by maximizing your antioxidant and antimicrobial functions in the body. High dose vitamin C (50 g) and a wide variety of nutrients help your body to fight back! ​Stress at work, long flights, hours of time change and long hours can be a drain on the body. When we are stressed or on the road we don't eat properly and our bodies suffer. Get back on track in the shortest amount of time by replenishing via IV. Fluids and nutrients to help with lowered immunity are added to ensure you don't get sick from travel or from the stress on the body. This IV is more commonly known as the "Myers Cocktail". Phosphatidylcholine is a fat found in the membrane of every cell in your body. It has been found to be incredible at treating neurotoxicity from heavy metals as well as as an adjunct to chelation therapy in cardiovascular disease patients. This treatment may also be of benefit in liver disease or hepatitis. Vitamin C is a potent antioxidant that has the power to boost immune function, increase resistance to infection, and protect against abnormal cell growth. Doses of vitamin C are increased over several treatments to ensure safety. These doses can range from 25-75g per treatment. IV therapy can be very useful for the treatment of hypertension or his blood pressure, arrhythmia or CVD. The minerals found in this IV are specifically formulated to reduce vascular tension and can improve the hearts rhythm.